Severs Disease Dr. Timothy Young of Issaquah Foot and Ankle Specialists discusses Sever's Disease. This is a common cause of heel pain in children. Heel pain in children and adolescence: is the most common osteochondrosis (disease that affects the bone growth). Osteochondrosis is seen only in children and teens whose bones are still growing of the foot. Sever's disease or Apophysitis is a common condition that afflicts children usually between the ages of 8 to 15 years old. Often this is confused with plantar fasciitis which is rare in children. 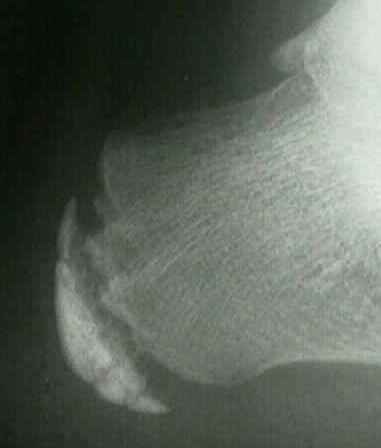 This is a condition of inflammation of the heel's growth plates. Underlying anatomy: This is a condition that affects the cartilage growth plate and the separate island of growing bone on the back of the heel bone. This growth plate is called the physeal plate. The island of growing bone is called the apophysis. It has the insertion attachment of the Achilles tendon, and the attachment of the plantar fascia. This island of bone is under traction from both of these soft tissue tendon and tendon-like attachments. Causes of Sever’s disease: Mechanically, the heel takes a beating. And the apophyseal bone is located near the point of impact for the heel bone at heel strike and with most weight bearing activities. This includes running, jumping and walking. Heavy impact activities like soccer, football and gymnastics are commonly associated with this problem. In addition to this, there is traction on this apophyseal bone and the associated physeal line of growth cartilage. This traction on the apopysis (island of bone) along with the impact of weight bearing activities can lead to inflammation and pain. Tight Achilles and calf muscles also can contribute to this problem, and why stretching is discussed later. Additional factors: Having flatfeet or very pronated feet can make one prone to Sever's disease. But also patient’s that have a very high arch foot structure tend to have a very high shock and high impact heel strike. This also puts extra stress on the heel and apophysis. Symptoms of Sever's disease: Symptoms include heel pain related to sports activities and worsen after those sport and exercise activities. However, some children who are not in a sport may also get this if they are physically active. If you notice that your child is “walking on their toes” this is a sign of possible heel pain. The pain is usually on the back of the heel, the sides of the heel, the bottom of the heel, or a combination of all of these. We typically don't see swelling with this, however if pressure is applied to the sides of the heel pain may be reported. Sometimes the pain is so bad the child will have to limp, or take a break from sports activity either for a few days or few months. Diagnostic evaluation: This can include physical examination and x-ray evaluation. 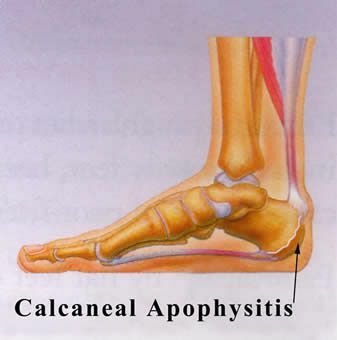 X-rays may show some increased density or sclerosis of the apophysis (island of bone on the back of the heel). This problem may be on one side or bilateral. Treatment of Sever’s disease: Home treatment consists of calf muscle stretching exercises, heel cushions in the shoes, and/or oral anti-inflammatory medications like Tylenol or Advil. Icing the area may provide some temporary relief. If the condition persists the child should be evaluated by a podiatrist for abnormal foot function. In severe cases a below the knee walking cast may be required. Treatment may require the use of custom-made shoe inserts called orthotics. Orthotics work by correcting foot function and will fit into most normal shoes and athletic cleats. Severe cases will need to be treated with a cast boot. Take a break from sport activity until the pain has significant improvement. If the problem is bad enough, it is important to totally rest the symptomatic foot. Over-the-counter anti-inflammatory medicine as recommended by your pediatrician or podiatrist. The above x-ray show fragmentation and sclerosis of the heel often seen with apophysitis. We treat children with foot and ankle deformities and have established protocols to deal with heel pain. Most children respond well to stretching exercises and prescription orthotics, Orthotic Rx Center. Is your child suffering from heel pain? We can help.